Let’s face it. Life gets crazy, and sometimes we let certain cleaning chores slide. Pools need daily care, but they often get neglected when there are other pressing matters at hand. Unfortunately, the longer a pool is ignored, the dirtier it gets until your science teacher’s favorite green microorganism moves in. Yep, that’s right. You’ve got algae! It doesn’t take long for algae to take off and “bloom.” Depending on temperature, contaminants, sunlight, and circulation, algae can bloom in a matter of hours, days or weeks. At temperatures below 51 degrees F, it won’t grow, so it’s safe to cover the pool and let it hibernate until the thermometer rises in spring. Algae doesn’t need much to thrive. There are many different types of these tiny critters that are loosely lumped into the plant kingdom. Their green color comes from chlorophyll, which is used for photosynthesis. If you remember from your science classes, photosynthesis occurs when carbon dioxide is taken in and oxygen is expelled. All algae needs is some sun and food, and it can easily thrive in almost any still body of water. Pools have an abundance of food for algae, especially those with lots of debris and dissolved solids. They even feast on chlorine, which is why they can take over when chlorine levels aren’t maintained. What’s so bad about algae? While not toxic to swimmers in and of itself, algae can cause other problems such as hosting bad bacteria like E-coli. They can also reduce visibility for divers who are attempting to rescue a person or pet. It can clog up pores in pool filters which can render them useless. It can eat into pool surfaces and stain them. Since they’re microscopic, they can easily hide out in crevices, behind pool ladders, under pool liners, etc. So basically, you have to be vigilant to prevent it in the first place. An ounce of prevention is worth 15 thousand gallons in the case of keeping algae out of pools. Depending on the level of algae bloom and filth, there are six basic steps involved in cleaning a green pool. We’ll get into more detail below. If you can’t see at least 6-8 inches below the water’s surface, call a professional. The pool will need to be drained and acid-washed. If you can see 6-8 inches below the surface, roll up your sleeves and get busy. First you need to remove as much debris as you possibly can. This will take away the algae’s food source and help the chlorine work better. You’ll need a telescopic pole. Start by skimming the surface with a skimmer net on the telescopic pole. Switch the skimmer to a deep pool net and remove all the big debris from the pool’s bottom. It may be hard to see it if the water’s very cloudy, but keep at it until you don’t see any substantial debris in the net. 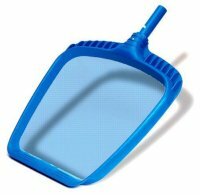 Read our pool cleaner reviews to find all the cleaning tools you’ll need. You can use a fancy test kit or cheap test strips. Your ideal pH is 7.2 or below. If it’s too high, you’ll need to add muriatic acid (a gallon at a time) or a prepared pH decreaser. Getting the pH low enough will minimize water cloudiness after the next step. You should also test for CYA (cyanuric acid). You can get special test kits for this. CYA is like sunscreen for your chlorine. If it’s lower than 30 ppm, the sun will break down the Free Chlorine needed to keep algae at bay. To calculate how much CYA you need, use this handy PoolMath Calculator, which also helps calculate other measurements like pH, salt, etc. If CYA is too high, you’ll have to remove pool water and replace with fresh. Use the PoolMath Calculator to determine how much water you’ll need to remove/replace. Now test for free chlorine with an FAS DPD test kit. Use this CYA – Chlorine Chart to determine how much free chlorine you need to reach shock level. No, this doesn’t involve electricity. Basically, it’s adding a bunch of chlorine, but you don’t just pour a bottle in and walk away. After your pH is adjusted to 7.2 or below, get a 25 pound bucket of granular chlorine. It may seem like a lot, but it’ll save money buying it like that in bulk since you’ll need chlorine on hand for regular adjustments. When you determine how much chlorine you’ll need, toss the proper amount of granules out evenly over the water, kind of like you’re feeding corn to chickens. Note: Don’t feed chlorine granules to chickens. You can also use liquid chlorine. Walk around the pool’s perimeter to toss or pour it in so you get chlorine in each area. Let the pool filter pump run to distribute the chlorine throughout the water. Note: Keep the pump and filter running from this point until the pool is totally clear. Test the free chlorine again after an hour, and if it’s at or above shock level, that’s good. Keep testing every few hours, at least twice a day, adding more chlorine when needed with the pump running, until the water is crystal clear. This could take a few days depending on the severity of algal growth. About 24 hours after adding chlorine, you’ll see a drastic difference. Your pool will most likely not be green anymore, but will probably still be cloudy due to all the dead algae. Keep the pump running. Brush the walls, ladders, and steps to dislodge any stuck algae so it can be filtered out. To remove dead algae that sink to the bottom of your pool, use a manual pool vacuum or run a robotic pool vacuum until the water is crystal clear. Clean your pool filter and vacuum filter bags a few times a day during the shock process. After the water is clear and you’ve thoroughly brushed and vacuumed the pool, perform an overnight chlorine loss test (OCLT) to see if there are any algae left. Sun and algae will both deplete your chlorine. So test the free chlorine after sundown and the next morning before the sun comes up. If you detect a loss in free chlorine, then you’ll know there are still algae, so keep the pool at shock level for chlorine the next day. Repeat the OCLT the next night and before sunup the next day. When your free chlorine level remains the same or has only dropped less than 1 point, then you can let the chlorine return to target level. Now that you’ve rid the pool of its tiny green invaders, keep it that way! 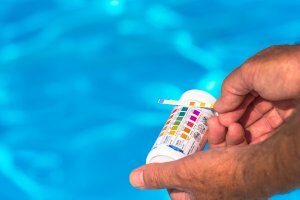 Make sure you test your pool water consistently, preferably once a day, but at least once per week. Stock up on all the pool chemicals you’ll need to make adjustments when needed. Keep your free chlorine, CYA and pH in acceptable ranges. Invest in a good chlorinating system (either a floater, in-line or salt system) to keep an adequate level of chlorine in the pool at all times. Brush and vacuum the pool at least once a week. Clean your pool filter regularly and upgrade if needed. Consider buying an automatic pool cleaner to make things more convenient. We have several top-rated models listed here so check them out to see which one would be best for your pool.